I reviewed the 2006 Red Label a while back and found it to be a bit better than this wine or at least a bit more approachable. 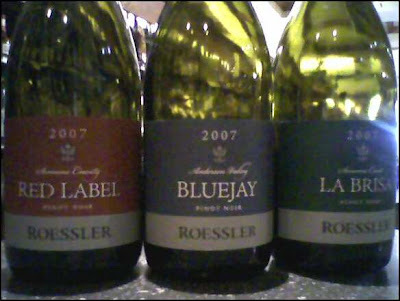 What I mean by that is I think the 07' is much more austere and perhaps cooler whether Pinot that doesn't have the lush fruit that the 06' displayed. It's still nice wine, but I think it needs some time for the flavor, acid, and tannin to meld together a bit more. On the nose I got bright red fruit aromas such as red currant, cranberry, cherry, and raspberry. There is also a touch of earth and white pepper and when the wine breaths a bit more some wild strawberry notes begin to appear. On the palate I got tart red currant, red apple skin, bing cherry, and a touch of some rustic and bitter rhubarb. There are definitely some bitter stemmy notes on the finish that throw the wine off a bit, but it could possibly just be very young tannin that needs to calm down a bit. On the nose I got ripe wild strawberry, raspberry pie filling, black cherry, chocolate covered raspberry sticks, and a hint of cedar and spice from the oak. On the palate this wine drinks with some very bright and sharp acidity and shows off it's cooler climate region of origin. The vines that produce this fruit hug right up close to the ocean in the Sonoma Coast appellation. Flavors of black cherry, spice, pomegranate, and a touch of mineral are all nuances that make up the profile of this wine. It has a medium length finish that is quite dry and shows a bit of heat from the alcohol. This was by far the best wine of the three by my palate. It had more complexity and a fuller more voluptuous texture. The color is also quite impressive and is far darker and more purple-like. On the nose I got big ripe black raspberry, chocolate, spice, licorice, and some brambly concord grape. The Bluejay really sings on the nose! On the palate the first thing I noticed was the round and mouth filling texture that I felt the first two wines lacked a touch of. Powerful black raspberry flavors combine with creme de cassis and licorice notes and some very brimming acidity and tannin on the finish.